The Saint John Parish Hall was rocking during the annual Middle School Spring Sing. 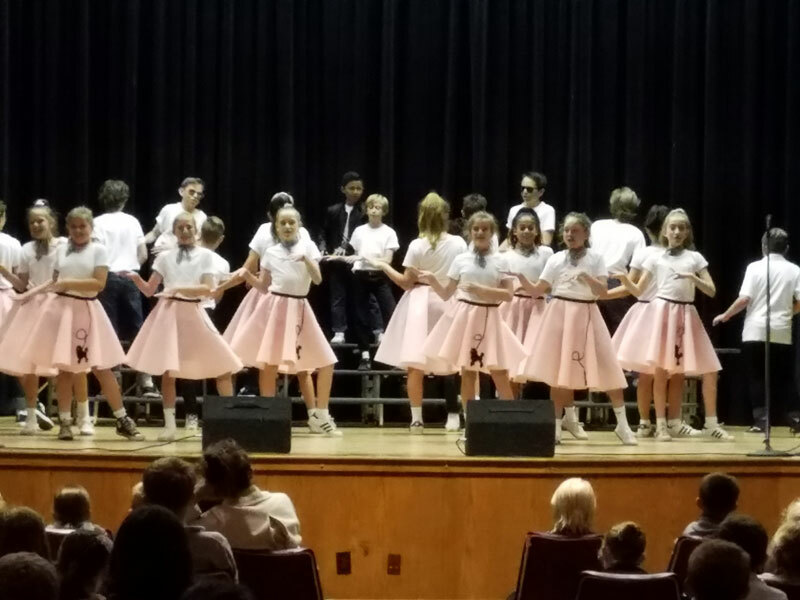 Originally designed to foster teamwork and cooperation among the 6th through 8th grade students, the Spring Sing has become a fun and spirited musical competition. Students are able to share their creative gifts and talents with the community. The middle school students participated in two performances, one during the school day for the students and teachers and one in the evening for their friends and family. Judging occurred at both performances using two different sets of judges. Each class was judged in the categories of singing, choreography, costumes, and originality. The scores from each performance were added together to select this year’s winner. The Spring Sing winner was Mrs. Klenk’s 6th grade homeroom with their rendition of Tutti Fruitti. Looking for her first win, Mrs. Klenk even went so far as to make poodle skirts for all the girls in her class. “6K showed lots of enthusiasm during their routine,” claimed Jill Burke, assistant principal and judge. Second place went to Mrs. Jones’ 8th grade class for their great choreography with Jailhouse Rock. There was a tie for 3rd place between Mrs. Heins 7th grade and Mrs. Mohan’s 6th grade homerooms. Everyone looks forward to Spring Sing each year. It really is a fun event!